The lineup for the second annual California Deathfest (same people as MDF) has been announced, and it’s stacked. 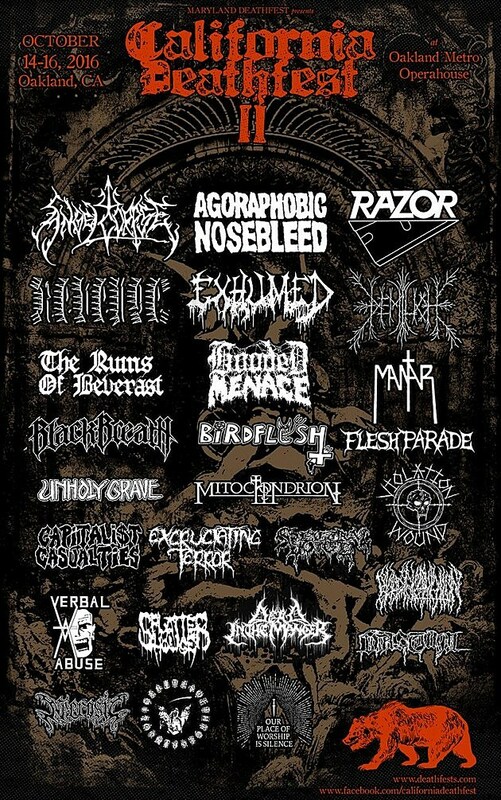 Going down on October 14-16 in Oakland, CA at the Metro, performers include Agoraphobic Nosebleed, Black Breath, Razor, Demilich, Exhumed, Hooded Menace, The Ruins of Beverast, Revenge, Mitochondrion, Vastum, Nuclear Assault, Spectral Voice, Blood Incantation and many more. Tickets for that are on sale now.